The directions here are for a bed, dining room table, and chair that can be used with any dollhouse. You can enlarge these patterns to the size you want. Make your furniture out of thin cardboard, vellum, or another stiff paper to create sturdy, more durable pieces. Cut on the solid lines, and fold on the dotted lines. 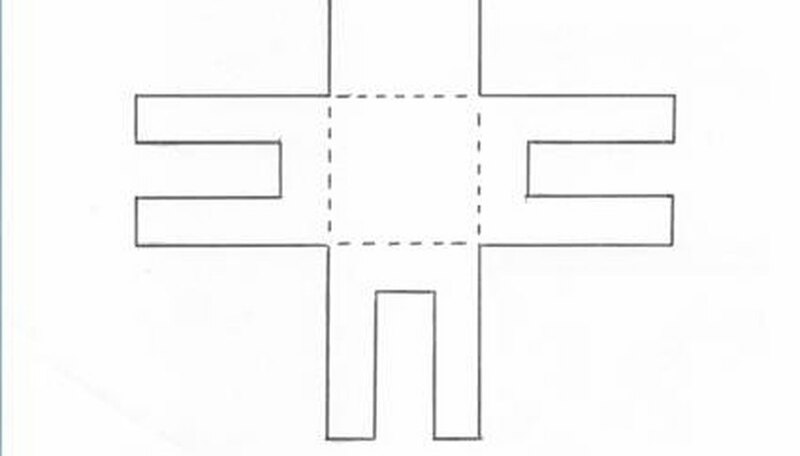 After you cut out each piece, fold the side with the dotted lines underneath so the lines won't show. Use tape when needed on the bottom side to make it less noticeable. When your furniture is finished, you can color each piece with colored pencils or markers. To make the bed, trace the pattern in the illustration onto vellum. Draw dotted lines as the pattern shows. Now cut out your design. Fold the top forward, or up, so it can serve as the headboard. 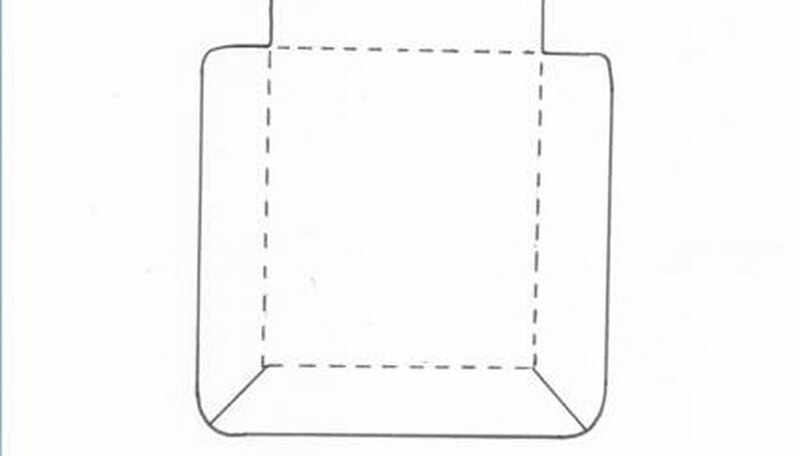 Fold the remaining three sides under along the dotted lines. This is the dust ruffle that will support the bed. Cut two small slits on the straight lines at the end of the dust ruffle. When you stand up the bed, the overlapping paper will appear to be fabric folding over itself just as a dust ruffle would. To make the table, trace the pattern onto vellum. Draw dotted lines as they appear in the pattern. It might look as if your table has eight legs, but this is to give the table extra stability. Cut out your table. 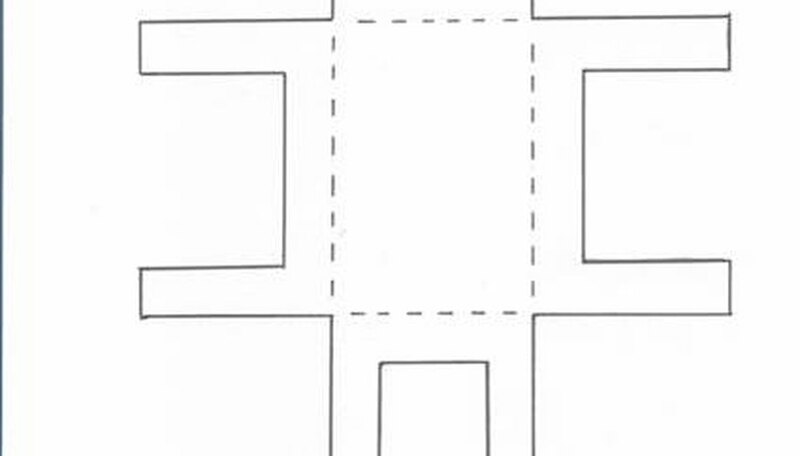 Fold down the four sides along the dotted lines. When you're done, the legs in each corner should fit together. Tape the legs together underneath with a narrow piece of tape. Joining them this way will balance your table. To make the chair, trace the pattern onto vellum. Add dotted lines like the pattern shows. Cut out your chair. Fold the back of the chair forward, or up, as you did with the headboard of the bed. Fold the three sides with legs under. Tape the legs underneath on the back side. Look through catalogs or store circulars for color photographs of items such as paintings or rugs. In catalogs, you might find pictures that are the right size to serve as miniature paintings. Pictures of rugs can be enlarged on a copy machine or scanner. If you want to make other pieces of furniture like a bureau, vanity, or sofa, unfold the pattern pieces you used to create and assemble your furniture and lay them out so you can see how they were created. Experiment with designs on paper patterns first, using paper large enough to get your fingers around. Thin poster board will work, or you can use vellum from any office supply store. Vellum folds more easily, but buying an entire pack is more expensive than poster board.